The concept of “everything in moderation” is one that is often easier said than done — as anyone who has ever waddled away from an all-you-can-eat buffet can surely attest. But while tossing moderation to the wind in favor of a third buttery yeast roll might just give you indigestion, other excesses can have much more lasting consequences — like bad credit. Indeed, one place you should always practice moderation is your personal finances, particularly when it comes to taking on debt. In our “swipe now, budget later” consumer world, however, credit card debt can be one of the hardest types of debts to maintain in moderation. If you’re not diligent, you may have an excess of credit card debt with high interest fees you can’t afford — which will only exacerbate bad credit. If you find yourself in over your head in credit card debt, you may need to consolidate with a personal loan to get yourself back on track. The goal of credit card consolidation is twofold: first, to simplify your debts by lumping them all into one loan, and second, to obtain a lower interest rate than you’re currently paying. So, for debt consolidation to be effective, you not only need a loan large enough to cover the debts you wish to consolidate, but you need to obtain one with a lower interest rate than is charged by any of the credit cards you’re going to consolidate. 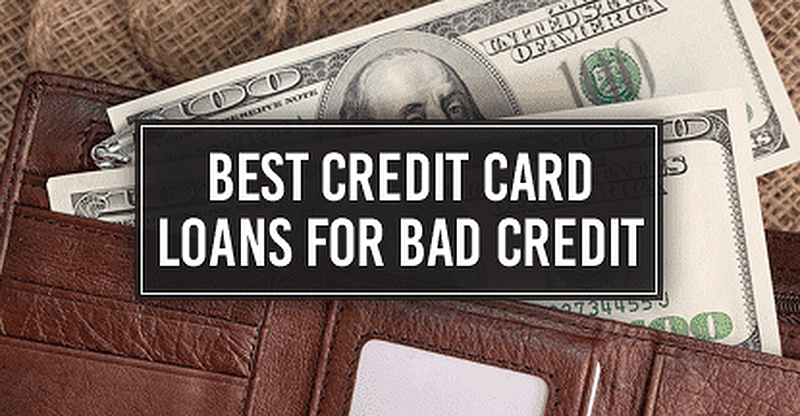 Unfortunately, when you have poor credit, both those objectives can be a challenge. Many lenders will be unwilling to extend you financing at all, let alone in any significant amounts. And those lenders willing to lend to those with low credit scores tend to charge fairly high rates. One solution to finding a loan with poor credit is to make use of online lending networks, which connect borrowers with potential lenders from around the country. PersonalLoans.com is a large lending network that offers both peer-to-peer loans as well as direct-lender loans from banks and other lending institutions. Loans can be obtained in amounts of $2,000 up to $35,000 for qualified applicants, with loan lengths ranging from three months up to six years and interest rates from 5.99% up to 35.99% based on your creditworthiness. While PersonalLoans.com has no minimum credit score requirements for applicants, its individual lending partners may have their own qualifications. Additionally, most personal loan lenders will have specific monthly income requirements, which may vary based on the size of the loan you wish to obtain and your individual credit risk. BadCreditLoans.com has been serving those with poor credit since 1998, offering personal loans through its network of direct lending partners in all 50 states. Loans from BadCreditLoans.com can range from $500 up to $5,000 for those who qualify, and can extend from three months up to five years. Interest rates vary from 5.99% up to 35.99% depending on the specific lender and your personal credit profile. As with PersonalLoans.com, BadCreditLoans.com does not have a set minimum credit score requirement, though its lending partners may set their own standards. You will need to be at least 18 years of age, have an active checking or savings account, have a reliable source of income, and have a working phone number. SignatureLoan.com provides personal loans to borrowers of all credit types, with a large network of bank and institutional lenders. Qualified users can obtain loans as small as $1,000 and up to $35,000, with loan terms of three months up to six years in length. Loan interest rates will depend on your individual credit risk, ranging from 5.99% up to 35.99%. Similar to other online lending networks on the list, SignatureLoan.com does not have a specified minimum credit score to apply, but its lending partners may have more particular credit score requirements. You’ll need to meet the same basic qualifications as for other loans, including being at least 18-years-old, having an active checking or savings account, and having a regular source of income. The most important thing to realize about using an online lending network is that the network itself is not actually lending you money. Instead, it’s connecting you with the lenders from its network of partners that are the best fit for your credit profile and financing needs. It will be the lender, not the network, that will be the source of your loan funds — and the company you will need to repay. Online lending networks connect borrowers with lenders. The actual loan will be issued from — and repaid to — the partner lender, not the lending network itself. The first step to using an online lending network to obtain a loan is to fill out the online application on the network’s website. This is typically a quick form that takes just minutes to complete. Once you’ve submitted your application, it will be sent to the appropriate lending partners for review. After a few minutes, you’ll be presented with any loan offers (up to the network’s maximum) that fit your needs. If you accept a loan offer, you’ll be forwarded to the lender’s own website to complete the loan process. You’ll need to agree to the loan terms you’ve been offered, determine where you want the money deposited, and digitally sign on the dotted line. In most cases, loan funds can be distributed as quickly as one business day but may take up to a week or more. While consolidating credit can also simplify your debts, the primary goal is usually to obtain a lower interest rate, thus reducing the size of your monthly payments and/or the amount of time it takes to pay off your debt. Therefore, the very first step you need to complete is to lay all of your proverbial cards on the table by listing out your credit card debts, including the total balance and APR for each card. Tabulating your credit card debt can show you the exact amount of debt you currently owe, which will determine the size of the loan you need to obtain. One thing to note here is that many lenders will charge what is known as an origination fee, which is a fee that covers the cost of processing the loan. These fees typically range from 1% to 5% of the total loan amount. Origination fees are taken out of your loan amount at the time of dispersal, meaning the money you receive will be your loan amount minus your origination fee, as shown in the example above. To ensure you have enough money to cover all of the balances you intend to consolidate, you should include any origination fees when calculating the size of the loan you will need. In addition to showing you how much to borrow, laying out your debts will also show you the interest rate you need. You’ll want to find a rate at least as low — though preferably lower — as the lowest APR charged by any of the credit cards you plan to consolidate. Otherwise, you won’t really save any money through consolidation because you will be paying the same amount of interest (or more, if you choose a longer loan to get a lower monthly payment). To see an example of how to figure out what you need for consolidation, consider the table below, which lays out Harry’s hypothetical debts. We can see from the table that Harry has a total of $9,560 in credit card debt spread across his four credit cards, and that the lowest APR charged by any of his credit cards is 19.99%. So, to optimize his consolidation, Harry needs a loan of at least $9,560 (after origination fees), with an APR below 19.99%. After you choose a loan and the funds have been dispersed, you can use them to pay off your credit cards as you normally would. If any of your credit cards have a bill due while you are in the middle of consolidating, be sure to make at least your minimum required payment to avoid hurting your credit with a delinquent payment. And, of course, stay on top of your new loan payments, as well. Whether its cheeseburgers or credit card purchases, moderation can be a hard row to hoe. But just as crash diets aren’t substitutes for adopting healthier eating habits, consolidation loans are not a fix-all for bad credit card habits. Once you’ve gotten out from under your high-interest credit card debt with a successful consolidation loan, you need to get to the root of the problem by addressing your financial excesses. In fact, as you’re laying out your debts to determine the specifics of your consolidation loan, take the time to delve a little deeper into the heart of those debts. Look at the breakdowns provided by your card issuer to examine your spending habits and brainstorm ways you can reduce or eliminate your trouble areas. This may be choosing a route home from work that doesn’t pass by a favorite store, nixing that premium cable package you don’t watch anymore anyway (who watches commercials when you can stream? ), or turning off that all-too-convenient one-click shopping feature on your favorite store’s app. For some, however, these changes aren’t real solutions. If your credit card debt issues stem more from a lack of income than from a lack of moderation in spending, consider consulting a credit or financial adviser for ways to troubleshoot your situation.